April 10, 1955 -- U. of I. at Chicago Up the River? April 10, 1955 -- The Chicago Daily Tribune editorializes about a $5,000,000 appropriation bill sponsored by State Representative William E. Pollack, a Republican from Chicago, to locate a four-year campus for the University of Illinois on the North branch of the Chicago River around California Avenue. "The university's budget requests have been cut drastically." states the editorial. "For the university to expand its operations and expenditures in Chicago when it can't get enough funds for the proper operation of the facilities that it now has would be the height of folly." [Chicago Daily Tribune, April 10, 1955] Ten days later Mayor Richard J. Daley would begin his first term as the Mayor of Chicago, and he would say toward the end of his career that helping to arrange for a branch of the University of Illinois in Chicago was his greatest achievement. The university's library is named for him. 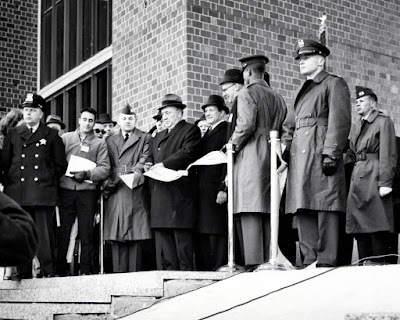 The photo below shows His Honor officially opening the new university on February 22, 1965, ten years after and over six miles south of Representative Pollack's proposal.